USTL provides full scholarships to outstanding students from Timor-Leste for two to four years of study at high-quality undergraduate degree institutions in the United States. Scholarship awards include full tuition toward either a bachelor’s degree or associate degree, travel, living stipends, medical insurance in the U.S., and visa costs. USTL is a program of the Bureau of Educational and Cultural Affairs (ECA), U.S. Department of State. Welcome and Congratulations to our new 2018 Fellows! 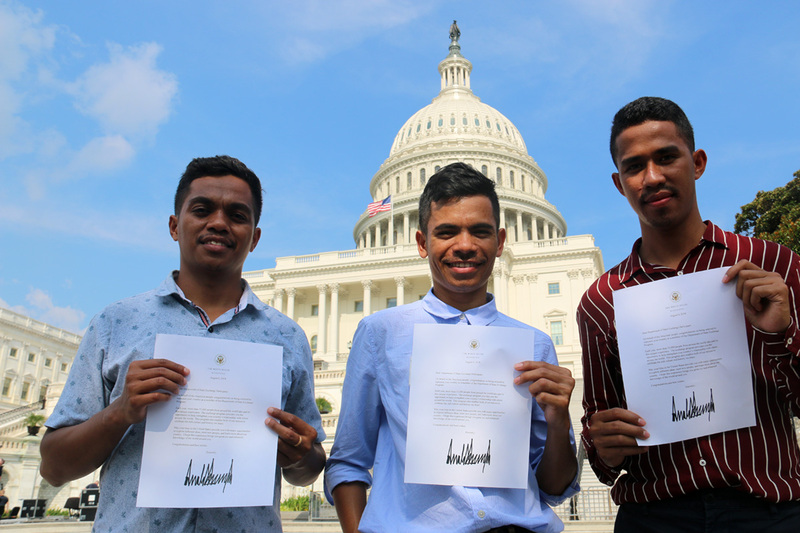 We are thrilled to welcome the newest 2018 United States-Timor-Leste Scholarship Program (USTL) recipients: Jorguino Aparicio Savio, Aderito Do Rosario Da Cunha Mambares, and Clinton Domingos Guterres. During the coming years, these Fellows will be attending the University of Minnesota, Tennessee Tech University, and University of Minnesota, respectively. These outstanding students were selected from over 300 applications for the USTL Fellowship this year. They will receive full funding to complete undergraduate degrees. The Fellows were welcomed by American Councils staff in Washington, D.C. in August for a 4-day orientation before departing for their respective universities. At the orientation, they participated in presentations about college life in America, cultural adjustments, and State Department exchange programs. They also got a chance to tour the U.S. Capitol Building, the Library of Congress, the Jefferson Memorial, the Martin Luther King Jr. Memorial, and the Lincoln Memorial! While on the program, Fellows will be provided housing, meal plans, insurance, and roundtrip airfare from Timor-Leste. They will also receive monthly living stipends and ongoing support from American Councils staff. Congratulations and welcome to our newest Fellows! We wish you all the best in your academic pursuits. The USTL Program is funded by the U.S. Department of State, Bureau of Educational and Cultural Affairs (ECA), and administered by American Councils for International Education in cooperation with the ECA and the U.S. Embassy in Dili.